In this Nov. 9, 2017, file photo, China's President Xi Jinping (L) and US President Donald Trump during a meeting outside the Great Hall of the People in Beijing. President Donald Trump suggested he could place a 10% tariff on iPhones and laptops imported from China, in an interview with the Wall Street Journal published Monday. He also said it's "highly unlikely" that he would delay an increase in tariffs from 10 percent to 25 percent on Jan. 1, just four days before a summit with Chinese President Xi Jinping. "Maybe. Maybe. Depends on what the rate is," the president said to The Wall Street Journal about the possible iPhone and laptop tariffs. "I mean, I can make it 10 percent, and people could stand that very easily." Apple stock was down nearly 2 percent in after-hours trading. Trump said he expects he will increase tariffs on $200 billion of Chinese goods to 25 percent. 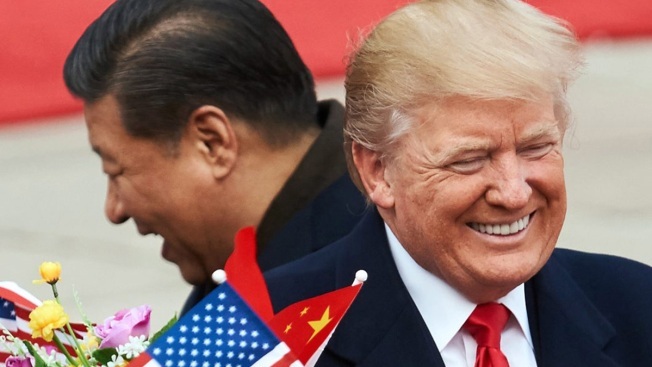 He will also add $267 billion worth of tariffs onto goods that are not already subjected to existing tariffs if the two countries don't make a deal. Apple's products are currently exempt from the tariffs. It previously announced that the tariffs would affect the Apple Watch, AirPods and other products, but were spared when the tariffs were announced. Although iPhones are assembled in China, several parts come from the U.S.
China says US tariff 'noise' won't intimidate China from CNBC.